Congratulations! You win 29 bonus points with this purchase! Very comfortable lenses even after a day out in the cold and wind. These lenses were prescribed by my optician. They are comfortable to wear and I use them from morning to night without problem. They last about a month before they need replacement. I believe this product is designed for extended (monthly) wear however, I clean my lenses and soak them overnight with ReNu solution. I find that I can use the lenses for 2 months before slight discomfort is felt and then I replace them. Great if you suffer from dry eyes. I do and these don’t dry up my eyes as much as daily lenses/other lenses. They also have a one of the highest levels of oxygen permeability. Allowing more oxygen to go through to your eyes and they also have a pretty good level of water content too. Would recommend to those who are advised to not wear lens for long periods as these can. Great product, feels easy to wear and looks great. I use these most days, they are the most comfortable lenses I've ever used. Excellent contact lenses, if cleaned properly will last two months not one with 18h use on daily basis. Great quality do not irate eyes like standard contact lenses do with long daily wear. I've used these for a few years now and I wouldn't use any other. Great quality, have recommended to people I know. Because they are so thin they break easily, but are very comfortable. Exactly the same as you get from the opticians but cheaper! I have passed your name to a friend. My eyes feel perfect and comfortable to wear Biofinity lenses. The best lenses i have ever wear!! I like these lenses. Quite comfortable and not irritating. Great lenses, comfy and easy to wear. Great product and identical to those provided by the optician and even better than that they were £138 cheaper. Brilliant. I have not actually used any of the contact lenses I have received yet due to having spares available from a previous company so unable to comment as yet on this product. A good, comfortable lens. I have worn these whilst SCUBA diving and they seem to continue to work well afterwards. I use them every day, except weekends when i remove for a couple of days to rest my eyes.nI have had no trouble related to these lenses,they are great,but i would not recommend to anyone as i think lenses are a personal item to be selected carefully to each persons needs. Quality brilliant, I used these lenses as a replacement for my *** prescription, less than half what I pay at ***. I use this lens because I tend to wear lenses for long periods of time and the comfort of the lenses over the time is great. My optician put me onto them several years ago because of this as they also allowd the eye to "breath" easily. I much prefer them to the long term disposibles I was wearing as the cleaning process is very much easier. Additioally if travelling for long periods of time it is not neccessary to take the lenses out, they are OK for sustained wear but obviously over a shorter total usage period. I've always used CooperVision products and have never had problems with them. You get what you expect - well corrected vision. A foray into low cost daily disposibles was a disaster. The same prescription did not yield a lens which worked like the Biofinity. Great price, excellent product. Would recommend to everyone. 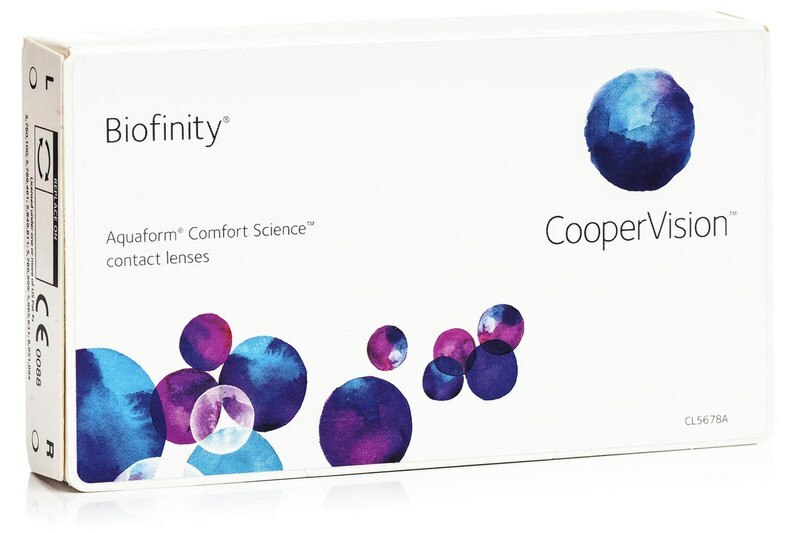 Biofinity from CooperVision are silicone-hydrogel contact lenses that offer exceptional comfort, excellent vision and a healthier lens wearing experience. These soft, flexible lenses allow plenty of oxygen to pass through to the eye, and support natural wettability with Aquaform® technology. Designed for daily use with a monthly change, they can also be worn continuously for seven days following optician confirmation. After consulting your doctor, you can now try new Biofinity Energys contact lenses that were specially designed to meet the demands of today’s life in a digital world. Customers who bought these lenses also bought ReNu MPS Sensitive Eyes 360 ml with case. Unfortunately you can't have that prescription with these lenses. Please consult with a specialist to find what brand and type of lenses are suitable for you and make sure you get a trial pair to confirm that they work. I only use contacts in one eye, can you supply these? We sell only boxes with lenses. If you want to purchase Biofinity lenses, you can find them in boxes with 3 or 6 lenses. Hi, why is there no option to select the cylinder and axis parameters for the contact lenses? If the lenses are posted 2nd class how long will they take to arrive. Do i need to buy anything else with these? Or does everything i need come in the box? Thank you for your question. In the box, you will find only 3 Biofinity lenses. You will also need a solution for cleaning the lenses which you can buy separately. I order this contact lens in blue colour, Why it not colour just normal one. What can I do. I want Blue contact lens ? Excellent contact lenses, in Serbia the price od this lenses is about 20 to 25 euros for box of 3 lenses...I usually wear lenses about 3 days and nights, even sweem with them!!! Thank you for letting us know, Nenad. I am happy to hear that prices are suitable for you. Please note that swimming with your contact lenses on may increase the risk of getting an infection in your eyes. Please ensure that you wear at least protective swimming glasses. Hi, i am wear my lenses on a daily basis only because i like to clean them each day, but they really can last a month and dare i say it, longer, they are extremely comfortable !! I have used many different brands of contact lenses. they are always made my eyes dry and very often i had headaches. I have been usingthe 'Biofinity Cooper Vision' lenses for over 6 months now and they have made a massive difference to my EVA life. I work in front of computes for over 8 hours a day. These contact lenses are amazing. Do not think that you could find cheaper lenses. They definitely worth their money!! Hello, Thank you for your comment. We are glad you found a brand which you are so happy with. You are welcome... i feel lucky i tried them! Hi, can I wear these for 1 month before changing? Hello, These lenses are of extended or continuous wear, which means that the lenses can be left in the eye for their entire period of use and do not need to be removed even at night. Biofinity can be worn on a daily basis for a month. The packaging suggests that they can be worn continuously for up to 7 days but this has to be checked with an optician first as well as the fact for how long a lens can be worn as used as continuous.